Harley Quinn #51 Review – AiPT! Captain Triumph is here to save the day, but can he handle a world where Harley saves the day too? This is the first issue to be released since Harley broke DC Comics continuity, so expect crazy, self-referential fun. Harley broke most of DCU continuity last issue, and in this ish, she’s dealing with the fallout, namely the time-tossed hero of World War II called Captain Triumph! The golden boy of the Golden Age finds his black-and-white approach failing miserably in the gray areas of the modern world (although unfortunately, there are still plenty of fascists for him to punch). It’s up to Harley to return Captain Triumph to his own time, but she’ll have to put the kibosh on his do-gooding first–right after she figures out what “kibosh” means! This issue is coming off the extra-sized continuity-breaking 50th issue and directly spinning out of that is Captain Triumph. This is an actual Golden Age hero who will most likely jive in a hilarious way with the modern and crude Harley Quinn. This issue introduces Captain Triumph with an amount of gusto akin to Captain America. He’s from a different era where punching bad guys was simple, but he’s also confused where modern tech may seem like a threat rather than merely a possibility. He’s a man lost in time and–unfortunately for Harley–it’s her fault. That plays into a cliffhanger that raises the stakes for Harley’s well being and should be fun to see how things play out, especially from a Golden Age hero with proper manners. While all this is going on, Harley and her mother get some key scenes that continue to develop Harley’s point of view in being a hero. 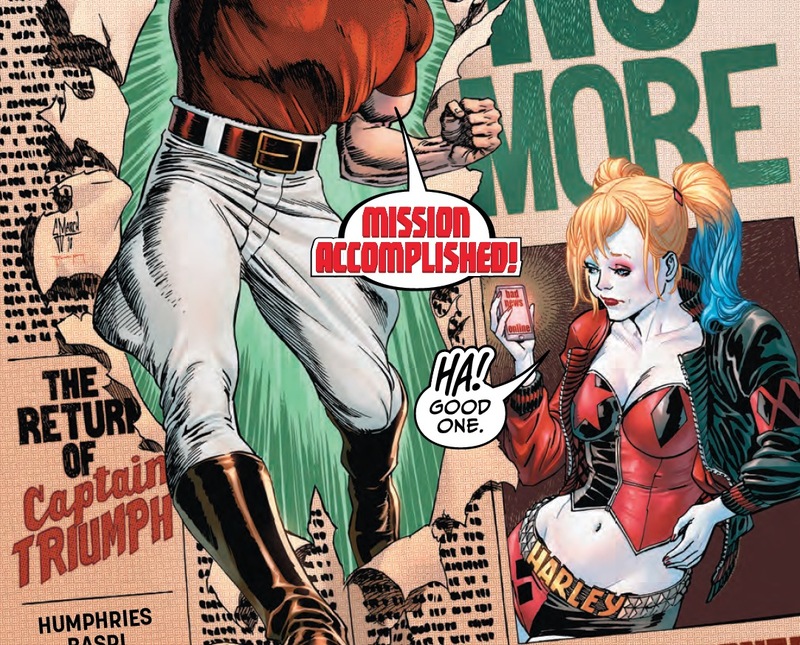 Humphries puts into question Harley’s original costume, for instance, to remind us how objectifying the costume can be. It’s not quite clear how Humphries is going to develop Harley, but he’s clearly steering her in a direction where her previous villainy and present heroics must come to a head. The art by Sami Basri suits the clean and bulky look of Captain Triumph. There’s more than one action scene and that gusto I mentioned of Triumph translates into his smashing and jumping. Harley always looks great and very much like the Suicide Squad likeness. Triumph actually takes up too much of this book in ways that feel like decompression of the story. Seven pages are devoted to the character doing heroic things that don’t establish much. A full-page spread of him flying over Harley’s head has a nice effect as we witness Harley’s reaction, but again, it stretches the narrative and makes the overall package seem light in content. I like this issue and I’m curious to see where Sam Humphries goes with Captain Triumph and Harley’s relationship. It’s a lighter issue to be sure though, and doesn’t accomplish much in its 20 pages. I like this issue and I'm curious to see where Sam Humphries goes with Captain Triumph and Harley's relationship. It's a lighter issue to be sure though, and doesn't accomplish much in its 20 pages.